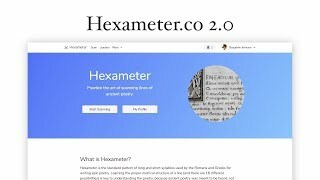 Hexameter.co, a website created to help students, teachers, and lovers of ancient poetry practice their understanding of poetic meter. I created this website about a year ago, and it has seen hundreds of thousands of user attempts. Does it work? I think it does, and I think my data backs me up. Visit hexameter.co and see for yourself! 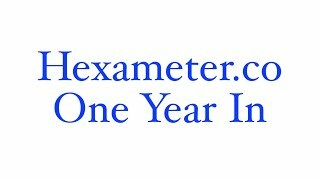 Visit http://www.hexameter.co today! 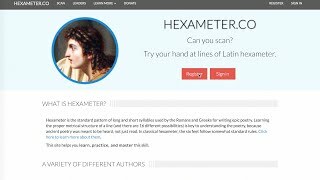 Hexameter.co is a free website that helps you learn how to scan lines of Latin poetry written in dactylic hexameter. Okay, it's way cooler than that sentence makes it seem. The site is adaptive, meaning it works based on your own skill level, and there are even some cool features like a rating, leaderboard, and classrooms for teachers to manage their own students. 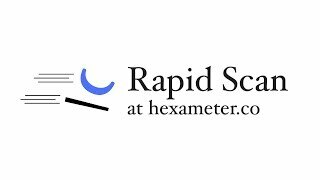 Go to hexameter.co now, sign up for a free account, and practice your lines of scanning!